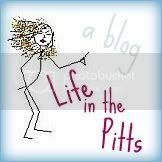 Life in the Pitts: I might just skip church. For a year. Bless your heart. You can do it! I'd give it 6 months though and then I'd be begging to get outta there. Somehow I still don't have a calling at our new ward, so I'm going to avoid writing any of the numerous things that came to my head. Primary was hard for me. I was much happier doing Ward Activities. Love my kids but other peoples make my nerves raw. ha HA! I also got the same calling. Kinda cruel, seeing as that my kid just got old enough that I thought I'd have a child-free 2 hours. There's really good advice at the front of the nursery manual. good luck. I have three kids...but can't do the nursery! Too much! Hey now!! Nothing is wrong with the nursery :) It is a great calling. Make it fun, have some structure, actually teach a lesson, and you will be surprised how fun it will be. I learned begrudgingly from experience :) Good Luck!! 8 years later we have 4 kids! I'm the nursery leader and I love it!!! I think kids are the greatest!!!! Good luck!